This is the second in a series of posts about Mount Fuji. 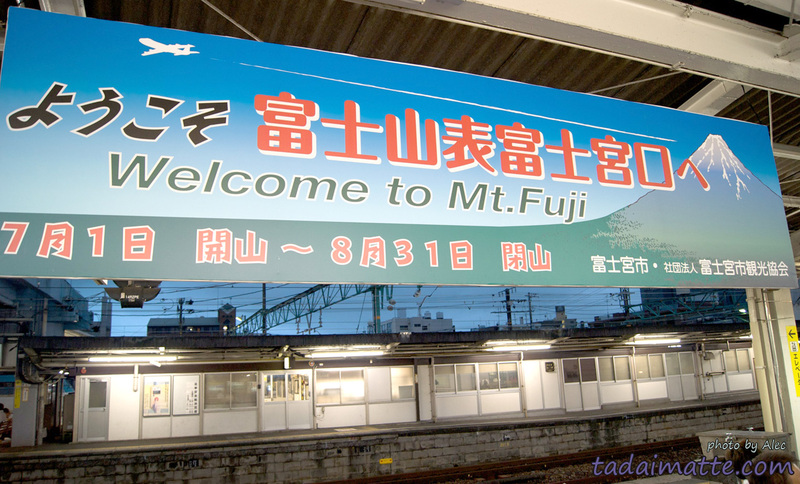 Mount Fuji is divided up into stations ranging from the numbers one to nine. 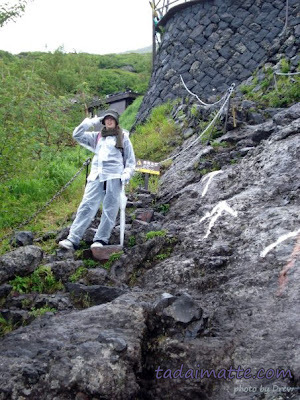 Most people consider the proper "climb" to be from the fifth station, as towns and forests occupy the gentle slope that is the bottom of the mountain. 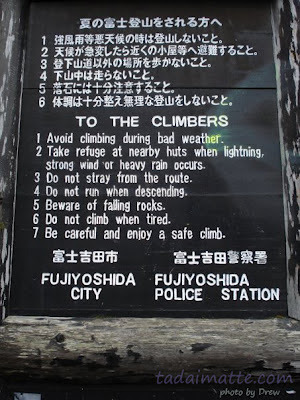 The Kawaguchiko Trail (also known as Fujiyoshida) starts in Yamanashi Prefecture at an altitude of 2,305 metres. The ascent is supposed to take about five hours minimum. If it was only Drew doing this climb, he would have been there in four and a half, easy. However, as he was charged with a bunch of slowpokes, we were looking at a much longer ascent, and not a lot of time to do it in before sunrise. At the fifth station, once the concerned cab driver had left and we had gotten into our cold-weather gear (by the way, the fifth station is not very far up, and it was July, so this was a bad idea), Alec took an object out of his backpack and told us, "I even brought a hurricane flashlight in case our flashlights run out of batteries!" "Nobody else brought a flashlight!?" Fifth Station - 2,305 metres: The journey between the fifth and sixth stations gave me a false sense of hope and confidence, but poor Gwen was winded and gasping as soon as the trail got hilly. Drew, eager to make good time, loped ahead. I held the flashlight and tried to shine it back behind me to help Gwen and Alec, while Drew and I continued on in the dark. Drew took Gwen's backpack to help her along. Sixth Station - 2,438 metres: Was a few toilets and nothing more. We started to continue, but a mere fifty metres up, it began to get very steep and we realized that Gwen was not going to be able to make it. She wore brand-new hiking boots and had already developed blisters! We came to the decision that the newlyweds would stay behind at the sixth station until sunrise then go at their own pace while Drew and I continued with the flashlight, and we would meet them at the top or on the way back down. The others set up a little camp in the dark and rain while we pressed on. Seventh Station - 2,700 metres: In comparison, this station's 262 metre climb seemed to be impossibly far away. It wasn't a difficult ascent, but the rain had soaked through my jeans, long underwear, hoodie and shirt. I was freezing. I ended up buying a rain suit for ¥2,000 at the tiny shop here, but my clothes were already saturated, so once I put them on it became a sauna. Worse, I'd had to take off and stuff my down jacket into Drew's backpack, where it had absorbed enough rainwater to pour into a glass. Sneakers and socks were a total loss as well. The lodge at the seventh station urged us to stay, probably knowing it was only going to get worse. We pressed on, persistent in our belief that we could make it to the sunrise, but light started to appear sometime during the 674-metre distance between Seven and Eight. Drew had aggravated an old foot injury, and so we hunkered down under a rock outcropping to rest, but the moment I stopped moving I began to freeze, so we kept going. Try climbing back down this with the taste of failure in your mouth. Eighth Station - 3,374 metres: Now the sun was high in the air and we knew we were defeated. I asked at a lodge about staying to rest, but we were turned away. The lodgekeeper said that Station 9.5 had a restaurant we might be able to rest at. I hadn't known there was a half-station on the horizon and imagined that it was probably a few more hours climb. Soon, I was sure I wouldn't get much further. We decided it was time to descend - unbeknownst to us, we were only 402 metres from the summit, less than the distance between Stations 7 and 8. 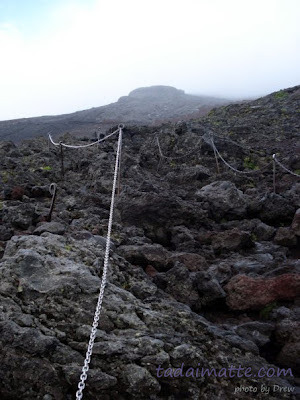 It was a tougher and steeper climb, but we had already passed the longest stretches of the mountain. My coat was a complete loss - the weather at the eighth station was only just above freezing, and it dripped with rainwater. I continued on in my also-wet but retaining body heat trusty Fangamer Snow Wood hoodie and the flimsy raincoat. Partway down we returned to our rock outcropping to rest; here Drew cracked his skull on the rock after standing up too quickly. To this day, he maintains that Fuji tasted blood. We drank the only liquid remaining, the grapefruit Chu-Hi that was to be for our mountaintop toast, then moved on before I got hypothermia. 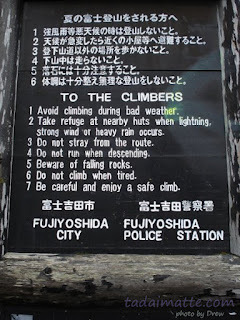 We were apparently coming down the super-dangerous Kawaguchiko route (steepest! hooray!) while everyone else was still climbing up it, but since that was where we'd left the others, we couldn't go down one of the easier trails. I had long stopped using the umbrella for its intended purpose and started using it as a cane. I would have just lain right down here if it'd been flat enough. At the seventh station we re-encountered Gwen and Alec who had managed to make it another station up. The four of us began to descend, but Drew's ankle was in too poor shape to go at Gwen's speed, so he went on ahead alone. My phone had also died at this point, so we were lucky to find the others when we did. Alec and I helped Gwen down to the sixth station and then the fifth. My legs were numbing from the damp cold. At the fifth station at last, the shops were finally open and we were able to eat. We grabbed food from a cafeteria and a battery booster for my phone so that I could assure people we were alive. We then got a bus down to Kawaguchiko Station, and from there, a taxi to the ryokan, the Japanese-style inn where we were booked for the night. None of us had any energy at all, but the ryokan staff prepared green tea and mochi sweets for us, so we ate and drank and were then shown to our room. We hung out all the wet clothes on the balcony, took baths and recharged. Then we went to the special observatory on the roof to look at the accursed mountain; the splendid view of Fuji being one of the key attractions of the inn. 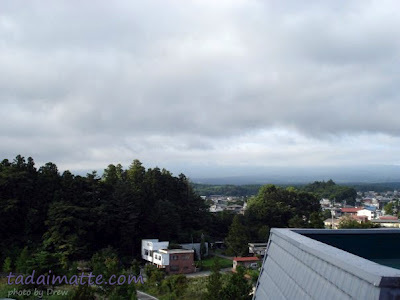 Mount Fuji, the ornery old thing, was completely covered by the clouds.